The boundaries for the original territory, if they had kept their same size, would have made present-day Las Vegas part of Arizona. 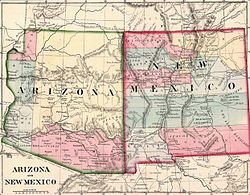 However, in 1867, Congress transferred the Arizona Territory's northwestern corner, specifically most of its land west of the Colorado River, to the state of Nevada. This reduced the territory to its current area.